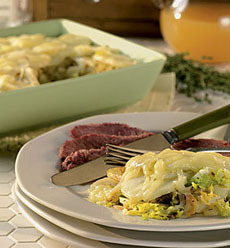 Corned beef and cabbage—updated with a cabbage, potato and Cheddar casserole. Why make the same old corned beef and cabbage? This tasty recipe combines potatoes, pretty Savoy cabbage and sharp Cheddar accents. Makes 8 servings. Bring large saucepan of water to boil. Add potatoes and cook for 5 minutes. Drain in colander and set aside. Preheat oven to 400°F. Coat 8" x 8" or similar-size baking dish with nonstick cooking spray. Arrange one third of potatoes over bottom of dish. Scatter one third of cheese over potatoes. Top with half of cabbage. Add another third of potatoes and another third of cheese. Top with remaining cabbage. Arrange remaining potatoes on top. Set remaining cheese aside. Cover baking dish tightly with foil. Bake for 45 minutes. Uncover and sprinkle with reserved cheese. Return to oven briefly to melt cheese. 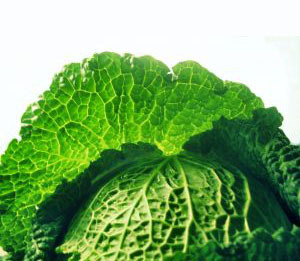 For a diet treat, steam Savoy cabbage and enjoy it with a gourmet mustard, like a flavored Dijon. Read our Mustard Glossary for ideas. by Janet Goulden | SXC. Recipe and photo © Cabot Creamery. All rights reserved. All other material Lifestyle Direct, Inc. All rights reserved.